Applying for student education loan at multiple banks from one place, is a dream come true for Indian students. This was made possible by Vidya Lakshmi (vidyalakshmi.co.in) launched by NSDL where the facility to get information about Education Loan schemes of banks along with the facility to apply for student education loan is available. Within three months of being live, 24 banks have registered on the portal and more than 45 schemes were integrated. The multiple aspects of Vidya Lakshmi are proving to be immensely useful for the students and parents looking for education loan in order to pursue higher studies. What is Vidya Lakhsmi and how is it useful for Student Education Loan? When out looking for an Education Loan, the following issues are faced. Which bank is offering student education loan? How to apply for education loan from that bank? What if I do not get the loan? How do I apply for more banks? How to manage multiple loan applications? How to know the status of my student education loan application in the bank? To lessen the burden of students and parents, Vidya Lakshmi was launched under the guidance of Department of Financial Services, Ministry of Finance, Department of Higher Education, MHRD and IBA. This website / portal integrates details of banks providing student education and the facility to apply for most of them at one place through a common application known as Common Education Loan Application Form (CELAF). This is a single window for students to get information and apply for Educational Loans provided by Banks as also Government Scholarships. Get information regarding Education Loan schemes of banks. Apply through the Common Educational Loan Application Form (CELAF). You can apply to multiple banks at once. Banks can upload status of loan processing. Students can email grievances and queries related to bank educational loans. The Dashboard enables students to know the status of their education loan. Linkage to National Scholarship Portal for getting information and applying for Government Scholarships. How to get Student Education Loan? There are three simple steps involved in getting the student educational loan – Register, Fill up the single form, Apply to banks! In order to register, you need to enter details such as name, mobile number, email ID, password. Vidya Lakhsmi is there to ensure that no student misses out on higher education for lack of funds. 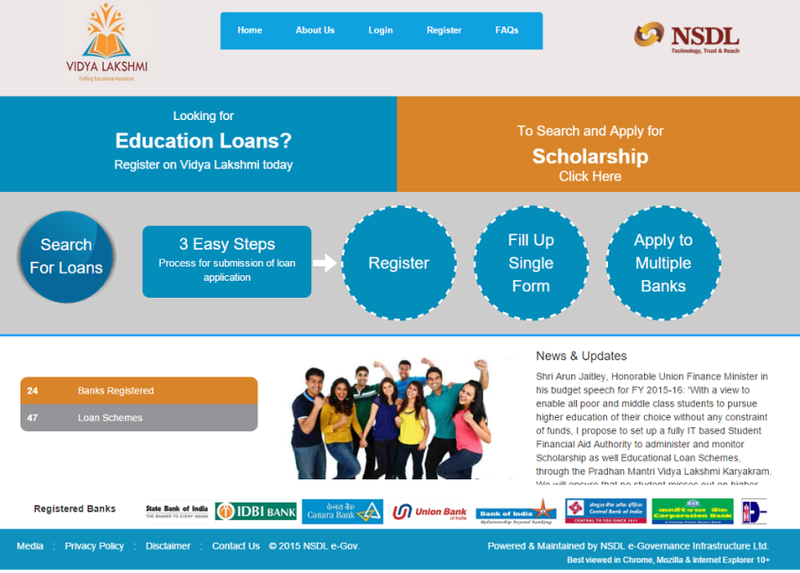 Check out Vidya Lakshmi – Go to Vidya Lakshmi to apply for student education loan or Govt Scholarships.